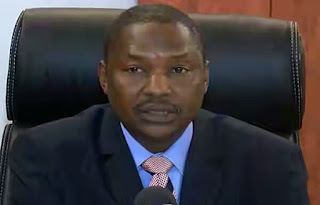 The Attorney-General of the Federation and Minister of Justice, Mr. Abubakar Malami (SAN), has in strong terms condemned the Economic and Financial Crimes Commission for attributing the leakage of the anti-corruption agency’s list of high profile cases to his office, Punch has reported. This was made public in a statement issued by his Special Adviser, Media and Publicity, Mr. Salihu Isah, expressed what he termed his “displeasure over the unfortunate and unbecoming innuendo” by EFCC attributing the leakage to his office. It would be recalled that Punch published names of some high profile people contained in list said to contain 106 names, but the EFCC denied the story. He questioned the basis for the EFCC’s indirect attribution of the leakage of the list to his office while denying that the CJN was not being investigated by the anti-corruption agency. He questioned how his office could have released a document containing a non-existent fact. The statement read in part, “The attention of the Honourable Attorney General of the Federation and Minister of Justice, Abubakar Malami, SAN has been drawn to a report in the media space insinuating that the Honourable Chief Justice of Nigeria, Hon. Justice Walter Samuel Nkanu Onnoghen, GCON and other former and serving government and judicial officers are under investigation for alleged corruption. “The report also listed other high-profile Nigerians who it claimed are purportedly under investigation for corruption to include former Coordinating Minister for the Economy and Minister of Finance under ex-President Goodluck Jonathan, Dr. Ngozi Okonjo-Iweala, present Minister of Solid Minerals Development and former Governor of Ekiti State, Dr. Kayode Fayemi, a sitting judge of the Federal High Court, Hon. Justice Abdu Kafarati, among others. “The Honourable Attorney General of the Federation and Minister of Justice wishes to express his displeasure over the unfortunate and unbecoming innuendo by certain persons and agencies which sought to accuse his office of leaking what was termed as classified information to the public. “This office, therefore, wish to state categorically, but with absolute repudiation, that it did not at any time leak such information to the media as wrongly alluded by the Economic and Financial Crimes Commission. “The pertinent question to ask is since the EFCC has publicly denied that the Honourable Chief Justice of Nigeria is not under probe or investigation; is it then possible for the same EFCC to have forwarded any classified information on a non-existent probe or investigation of the Honourable CJN to the Honourable Attorney General of the Federation? The AGF noted that the EFCC’s attribution of the leakage to his office was an “unsavoury attempt” to drag his office into a “petty squabble” with the CJN, as he was not aware of any ongoing probe of the nation’s topmost judicial officer. The statement also read, “The Honourable Attorney General of the Federation and Minister of Justice strongly frowns at any unsavoury attempt or conspiracy to drag his office and that of the Honourable Chief Justice of Nigeria into petty squabbles in the midst of burning national issues.